Club 108 is an activity program for individuals with early memory loss. Club 108 at the Verona Senior Center is a program for individuals with early memory loss. The program meets on 1st and 3rd Tuesdays and every Wednesday from 10:00 AM until 1:00 PM. There is no cost for the Club, but lunch is included during the program for $5. If you are interested in enrolling or have questions, please contact our case manager at Becky Losby at 845-7471. 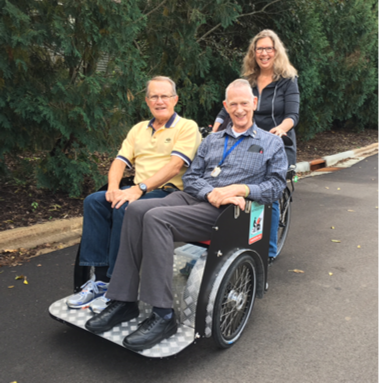 November 2018 – Club 108 members recently participated in the Cycling Without Age Greater Madison Trishaw rides at the Verona Senior Center. After having to reschedule the rides twice due to weather, the third time was the charm. The weather was sunny and warm – perfect for a bike ride into downtown Verona and then onto the bike trail for a short ride on the nature path. 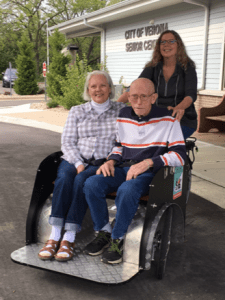 After rides were completed at the Verona Senior Center, Kate rode the Trishaw to Four Winds Manor where residents had the opportunity to ride as well. Cycling Without Age Greater Madison is a volunteer organization dedicated to making bike rides accessible to all ages and abilities. 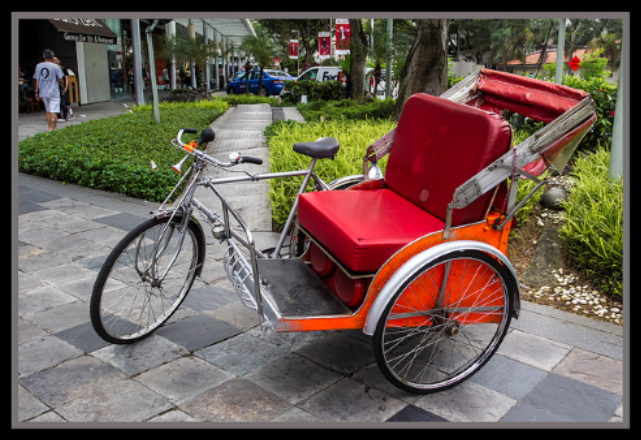 Kate Shaw and Duncan McNelly are volunteers that navigate the Trishaw for the organization. Thank you Kate and Duncan for a fun filled morning touring Verona! July 2018 – Where do we play games, work on puzzles, watch documentaries, listen to music, use a virtual reality program, plant veggies, and paint, just to name a few things? Where else – CLUB 108! Verona Senior Center, in tandem with our Caregiver group hosts members with early memory loss the 1st and 3rd Tuesday of the month and every Wednesday. 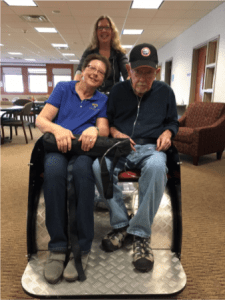 Tuesday meetings give Caregivers an opportunity to meet with other caregivers to learn and exchange information while Club 108 members enjoy doing different activities. 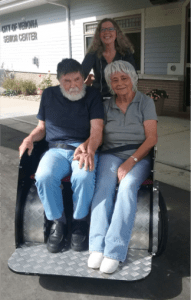 Wednesday meetings offer various fun events for Club 108 members, giving caregivers the opportunity to schedule some R&R time each week. 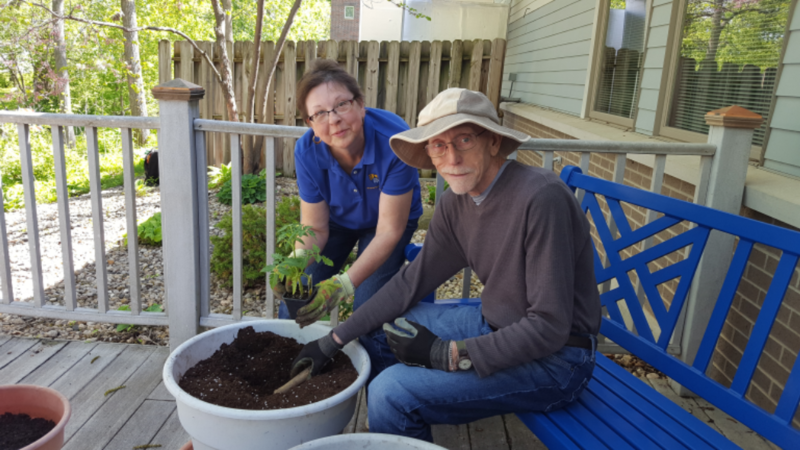 Members recently planted tomato, pepper and herb plants in pots out on the patio. Hopefully we will have some fresh veggies to share in late summer. Club 108 members are currently creating an artwork project in “Painting with Carol Ann”, which we hope to display in the Trailside Room. Feel free to stop in to say “hi” or share a special talent with us at any time!